Hospitality Noise Control is very important and Proper restaurant design and layout should take into consideration what the room will sound like. Soundproofing Acoustical materials are used in restaurant interior design to create a quieter environment for a better dining experience. Acoustical wall panels or ceiling tiles can be used in restaurant interior design to create a more pleasurable and comfortable atmosphere or ambiance. 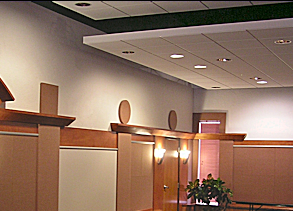 These acoustical treatments are not only effective, but aesthetically pleasing. 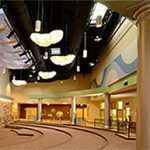 Our Acoustical Curtains provide unique solutions to any project. We can use both our sound blocking or a combination of sound absorbing lining to meet your needs. 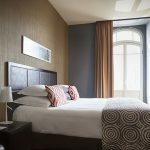 Our curtains have been used for Hospitality Noise Control. We can meet your budget and deadline. Our curtains are laboratory tested and meet commercial requirements such as flame retardancy. Acoustical Curtains are beautiful room treatments that look elegant and will be an asset to any project. 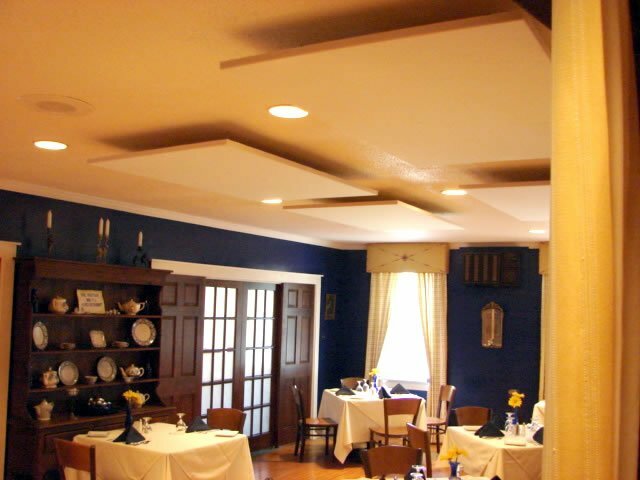 Froggtown Inn & Acres Restaurant has retrofitted our clouds to their existing dining room to create a quieter and more private conversation environment by using All Noise Control clouds. Pictures courtesy of Froggtown Inn & Restaurant. Steven Warren from Froggtown Inn & Acres Restaurant contacted All Noise Control with a typical restaurant noise issue. A quiet, quaint and relaxing environment was disrupted by travelling conversations and the going ons that happen in the general hustle of any restaurant. Dishes clanking, conversations carrying, doors opening and closing, kitchen noise, all lending to a interrupted dining experience. 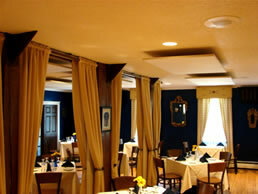 esthetics being very important, All Noise Control had custom configured ceiling clouds for Froggtown Inn. After they put them in place it added a comfortable design and texture to the space and did an amazing job at absorbing the noise bouncing throughout the space. 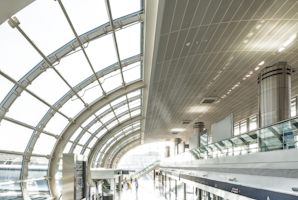 Acoustic Ceiling Clouds are much like the name implies, absorbent materials suspended from ceiling. They can be affixed to any existing ceiling or slope and can be custom cut and sized to fit architecturally in your space. They work by absorbing the sound waves ( which are in the form of heat ) and each time one of these waves reflects off the cloud, the soft open celled nature of the cloth absorbs it. To be exact it’s energy is depleted. 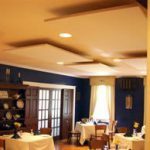 Placing them strategically through a restaurant can have an astounding effect on Hospitality Noise Control like it did for Froggstown Inn & Acres Restaurant. Froggtown Inn – ceiling clouds. Read More.